Here’s the bear looking through his hole. In the fall time they close up their dens with a bunch of sticks and branches. Before he comes out, he looks out that opening, and that’s what this represents. 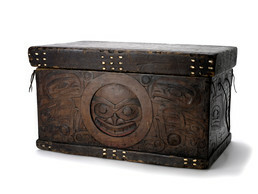 This clan leader’s chest – a bentwood box to hold clan regalia and crest objects – is decorated with operculum shells on the lid and base; these shells are the “trapdoor” pieces from red turban sea snails. Red paint used on the chest was probably hematite, ocher, or cinnabar mixed with grease and crushed salmon eggs. The central carving is a brown bear peering out of the entrance of its cave in spring; the large teeth and nostrils are distinguishing marks of this animal. Carvings of eagles flank the bear on each side, recognizable by their hooked beaks, wings, tails, and curved talons.